You can make and receive phone calls with Lync, just like a traditional phone. All you need is your computer speakers and microphone or a headset attached to your computer. In the Lync main window, either find a contact in your Contacts list, or type a person’s name in the search box and pause on the name. 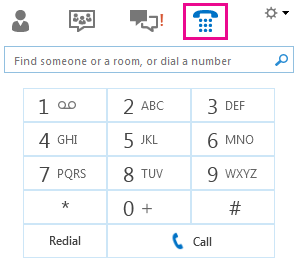 Click the phone icon to call the contact with Lync. Click the arrow next to the phone icon, and select a number. When the call is accepted, use the audio controls to mute, unmute and so on. For details, see the next section. Either click the numbers on the dial pad or type the number in the search box, and then click Call. Lync calls the number just like a regular phone. When the call is accepted, use the audio controls to mute, unmute, and so on. For details, see the next section. To put the call on hold, click Hold Call. To mute your audio, click Mute. To change your audio device, click the Devices tab, and then select the device you want to use. To interact with the phone system—for example, to enter a Lync Meeting passcode, click the Dial Pad tab, and then use the dial pad. Reply with an instant message instead of with audio or video. Set your status to Do Not Disturb to reject the call and avoid other calls. Answer the call with audio only.